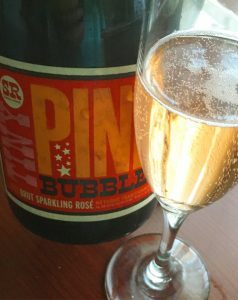 2013 Signal Ridge Vineyard, Brut Sparkling Rose “Tiny Pink Bubbles” Anderson Valley. The method traditional Tiny Pink Bubbles by Signal Ridge Vineyard is a luxurious and pure Brut Rose that has loads of pleasure and character in a grower producer (Champagne) style and it’s dry crispness makes it vital and food friendly. A pale salmon/orange hue and with a fine and vibrant mousse adds to the class in this serious, but without pretense, being a stylish and fun bubbly that delivers layers of bright citrus, mineral, strawberry and brioche notes along with hints of ginger/spice along with a opulent mouth feel, while still being vigorously fresh. Stephanie Rivin and winemaking/growing team at Signal Ridge have done a masterful job with this beautiful Brut Rose, as might be expected considering her husband Dan Rivin crafts arguably one of very best California sparkling wines under his Lichen Estate label! Signal Ridge does a fantastic set of wines and is a winery to watch, don’t miss The Princess & Peasant Pinot Noir and Carignan, as well as their Zinfandel, Chardonnay and this tasty Brut Rose Sparkler. These wines show exciting flavors and restrained alcohol with natural elements and are wonderful values, you get a lot for your money with Signal Ridge Vineyard, these Mendocino offerings are worth tracking down.